If Social Media isn’t one of the main tool used in your Network Marketing Business, then you are missing out one of the major free resources available to you! Why? Because, it has been founded that the social media giant, Pinterest drives about a quarter of the whole retail website referral traffic! From this data alone we can access the real potential of the Social Media in the Network Marketing business. A lot of the successful network marketing leaders have become successful, only because they finely blended their marketing strategies with social media. And of course, their hard work too. But this tool has definitely played its part. Even they have talked about this in their talks and through other mediums. People get inspired through social media platforms and they get to know more interesting and inspiring quotes which will definitely help them to get involved in network marketing business. The real potential has to churn out if your dreams to become a successful network marketer! Well we, will discuss why social media is a valuable tool in detail below. 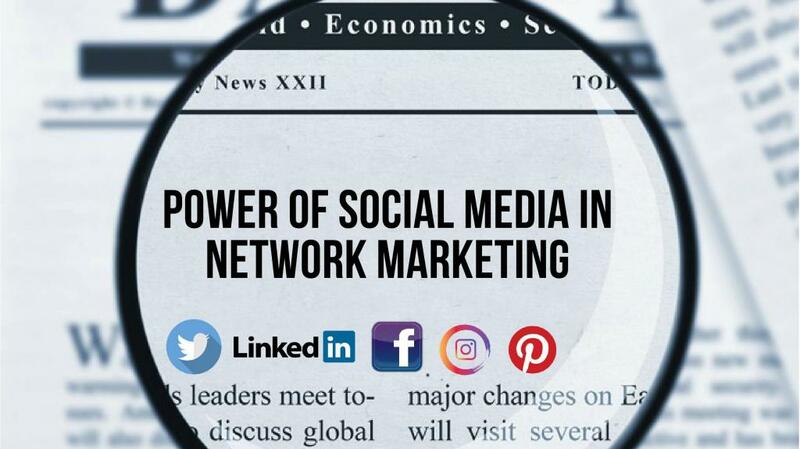 Why Social Media is a powerful tool in Network Marketing? Social media is one of the best online network marketing tools that we have in the present. There is no literally any boundary for the social media’s reach. You don’t have to be limited to your small town, city or even country! You can reach out to the maximum people with less time, or to be precise in a matter of a few seconds. Now, even the small entrepreneurs in the small and remote locations around the world can build their business without the need to spend a hefty amount and time on traditional marketing methods and also by traveling to other places. The world will be a really small place to market your products and services. You will have no limitations and can expand your business to reach places which were previously unreachable. Although this is the case, it would be much better, if you can really have a face to face conversation with the customers, after that initial reach through the online platforms. Maintaining connections and relationships with your clients or customers is very much necessary if you want to expand your network marketing business. Just as mentioned above, it would be always good to have those face to face conversation. But social media can act as a very important tool in nurturing those connections on a more regular basis or consistently. Social media platforms like Facebook and Instagram helps to keep in touch through messages or videos of inspiration or about the best practices to be followed. You can also interact through emails or phone calls. But social media helps to enhance communication a little further. Simple things liking a post, commenting and sending birthday wishes helps to strengthen your relationship with them. Social media provides you the features that help you to keep in touch with your downline or prospects consistently, through various methods and let those people know that you do really care for their success. Another exciting feature of social media in network marketing is that you can actually build your brand into the next level. More and more prospects will be coming in search of you. Social Media branding tells what are your missions and vision, who you are, your interests and much more, etc. This will attract more like-minded people and builds your prospect list itself. This does not mean that you can sit back and relax. But you don’t have to wait for a long time for the prospects to come and meet you. Instead, for trying really hard by the manual methods, people will come to you through the brand value you have created in their minds. Social media helps to introduce your business brand to a huge section of people, or literally to the entire world. And this created an influx of more people rushing towards you for sure! The possibilities of Social Media are immense in Network Marketing. It’s completely free (cheap in some cases) and easy. So do make sure that you really extract and use the real potential of social media tool in your MLM or network marketing business to the maximum! Everyone can easily leverage the power of social media in Network Marketing. It is a really great business asset if you use it carefully and wisely.